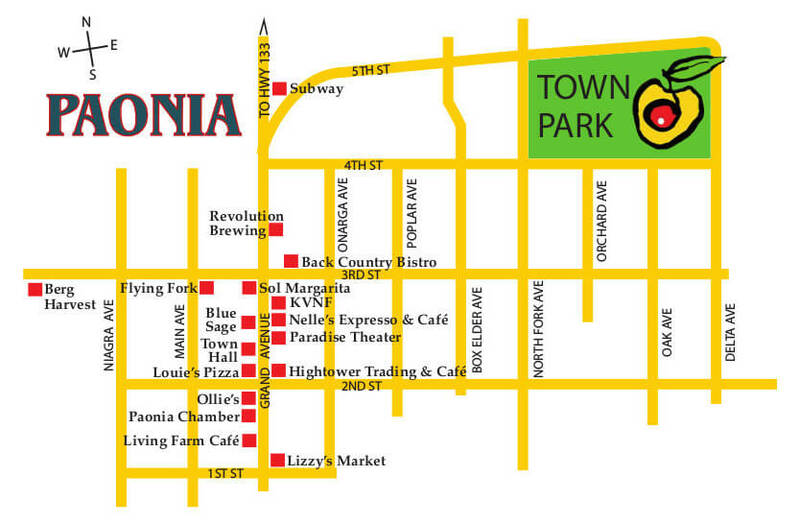 Paonia’s downtown is on Grand Avenue between 1st and 3rd streets. We invite you to stroll around town, discover the charm of Paonia and take advantage of some special offerings unique to Paonia Promenade. We have art galleries; farm supplies and farm-fresh food; clothing and jewelry; flower and coffee shops; even a co-working space! Stop by these participating businesses, and many more! 1st Colorado National Bank, 133 Grand Ave – Picking Up the Pace… Celebrating New Banking Technology by Giving Away a Stay-Cation! The Refinery, 138 Grand Ave – Locally made recycled clothing and resale clothing specials. Lehman Images, 217 Grand Ave – Enjoy beautiful images while sipping fine, locally made teas. Integrative Therapies, 229 Grand Ave – Free initial ten minute somatic movement consultation/session. Indigo Autumn, 230 Grand Ave – Our natural foods store is full of yummy treats, local produce and good- ness for the body and soul. Berg Harvest Mercantile, 73 Samuel Wade Blvd – Enjoy delicious homemade apple pie and freshly made fudge and relax on our covered patio with other local products that are sure to please. Lehman Images, 217 Grand Ave – Enjoy beautiful images while sipping fine, locally made teas. Integrative Therapies, 229 Grand Ave – Free initial ten minute somatic movement consultation/session. ship. Elevate Paonia Promenade is sponsored by Elevate Fiber and the Paonia Chamber of Commerce.